• Create, play, and save arpeggios instantly with live arpeggio sequencer. • Up, up-down, down, down-up, sequence, & random arpeggiator modes. • Access and chain together up to 512 user created arpeggio patterns. • Internal 2-oscillator virtual analog monosynth. • Note division sequencer (1/16th, 1/8th, 1/4 notes etc ). • USB, 1/4″ & 1/8′ audio out, MIDI in, MIDI out, CV trigger out. • Control external hardware and software synths. 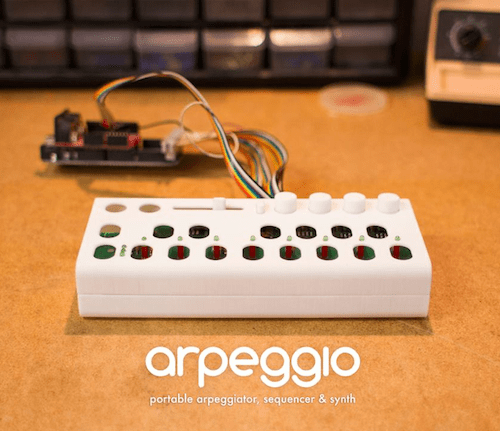 Add an arpeggiator to a synth that doesn’t have one! • arpeggio takes batteries or power from an AC adapter. Make melodies anywhere!